I have to admit, when I looked at last weeks calendar in the days leading up to it, I was cringing. Every night we had something we had to go to, people to see, things to do. It was supposed to be rush, rush, rush, followed by a weekend of quiet rest. Well, it didn’t happen that way. 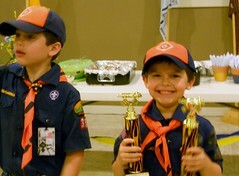 On Monday Nick realized he’d forgotten to call the cub scouts and remind them about the meeting, so that got cancelled. Tuesday the kids came home and said that the PE Exhibition for school was just for the cloggers and we are not them, so we skipped it (although we did still have piano lessons to go to). Wednesday we didn’t have a busy night planned, but a busy day. 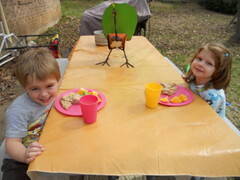 After the other family left, Greg and his friend had a picnic lunch on the back patio before her mom came to pick her up. I was just going to sweep and mop Wednesday afternoon, but after you move all the furniture to do that, you get to thinking “Hmm, does it have to go back the way it was?” and so I just shifted everything around a bit more. Everyone says it looks a lot more welcoming. I agree. There are more photos from various directions on the flickr feed, of course (and you can just click this one to get a bigger version, too). 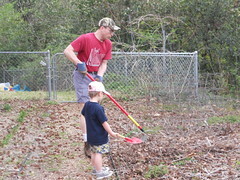 Since we didn’t have an evening activity we headed out into the yard and helped Nick with the gardening. 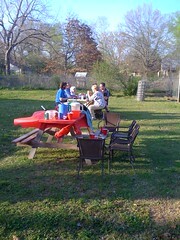 We planted several kind of flowers: cone flowers, zinnias, and some other kind that looks really similar. Nick doesn’t love the flowers, but he knows I do, so he put them nice places for me where I’ll be able to see them out the kitchen window and when driving in from the street. Thursday was a super busy day. First of all, St. Patrick’s Day. We got up, tuned the TV to the Holidays: Irish music channel, and tried to Irish dance (I took lessons as a child). 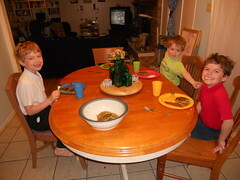 We had a traditional Irish breakfast: oatmeal pancakes (dyed green, of course), fried eggs, and bacon. The big kids school has a dress code which does not include the color green, so they made a rule that no one can be pinched for not wearing green. Ben wore a little shamrock pin we made, though David was having none of it. 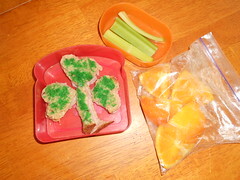 Greg wore a green shirt & I made him a special shamrock sandwich for his lunch. After I got all the kids to school, I headed over to have coffee with my friend M & J, which was lovely. 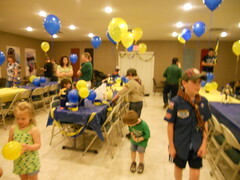 Came home and baked brownies and a strawberry cake for scouts, then picked up kids from school. 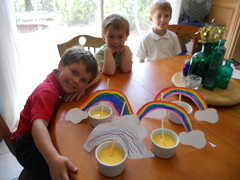 For our after school snacks, I had the kids make rainbows, then gave them a pot of gold (vanilla pudding – the off brand is really gold colored) to put underneath. 🙂 They LOVED it. Saturday we had a nice quiet morning at home. 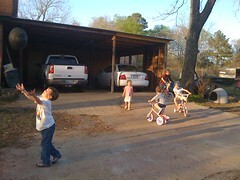 We played games and took a walk. 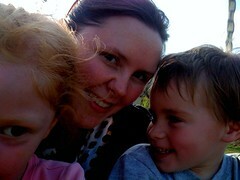 It was very peaceful (yes, it can be peaceful with three boys!). That afternoon I started getting texts from my best friend saying she was thinking of visiting, alone, that evening. 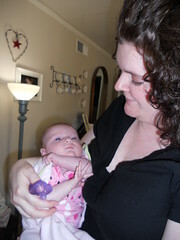 So after church and various church related meetings, we headed home and hung out with her for a while. She and Nick talked gardening while I got guest space set up and the kids showed her everything in the house and all their latest tricks on the trampoline and sang her all their songs and did all their dances. Then she and I escaped their orbit and went out for a late dinner and some live music. We ate far too much, laughed lots and lots and took exactly one photo the entire time we were together (my camera battery had died and her memory card was full, so we were left with bad camera phones). We came back home and watched A Room With a View and stayed up far too late. 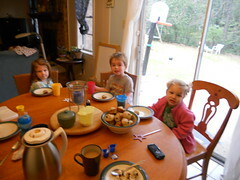 In the morning we sat outside with our coffee on the front porch and talked with the kids while Nick made breakfast. 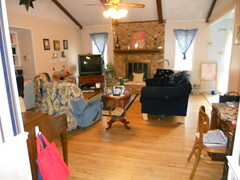 After breakfast I got a chance to show her all my latest things: jewelry, household organizational stuff, art, etc.) before she had to run back home and take care of her family (a three hour drive *sigh*). 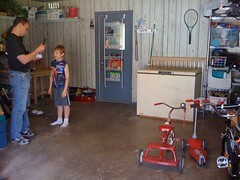 After she left I decided to use all my leftover manic energy to clean the garage, something that has been on the To Do list for weeks. 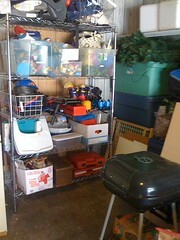 Eventually I enlisted the kids help, and then Nick helped me put together a shelf (he spent most of the day at work). 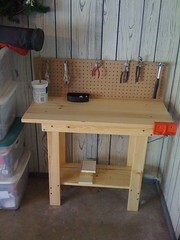 I also put together the kids workbench that they’d gotten last November. When we started the day there was barely a path through the garage. By the time we were done there was enough space for the kids to ride bikes around inside it. 🙂 I still have some boxes to go through and purge, but the whole place looks so much better. 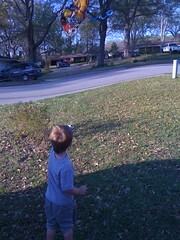 After Nick got home from work, we worked in the garden for a while, the kids popped some little firework poppers, and Greg learned to fly a kite (he’s never done it before!). So in the end we had a busy week, just not the one we’d had planned. 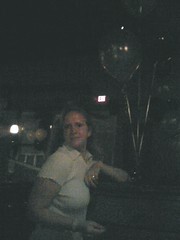 March 21, 2011 Lisa H.